As I build my collection of “Home Front Memorabillia” I’m finding that I have a few spare copies of some items.. I’d love to be able to share some of these things with you. This month I have ordered some replica ration books and will have a few extra, surplus to my requirements. This a fabulous resource to use in or out of the classroom. Ideal for Teachers, students or anyone with an interest in life on the home front in World War 2. This replica is faithfully reproduced by a professional printer, and is an actual copy of an Original British Ration Book dated July 1940. The name and address details are left blank front of the ration book therefore students could fill in their own details. Details of retailers are listed where the holder of the ration book can get their essentials from. General Information on use of the ration book. I have THREE to giveaway and will post them to anywhere in the world. oh my goodness I would LOVE one. We homeschool and my children would find this absolutely fascinating. That is so nice of you. This would be such a fun bit of history to have! However- I’m in the USA- Oregon, to be more precise, am I still eligible? OMG a ration book would be so cool to have. I have been trying to recreate my own with not to much luck. BTW you look amazing, love the new pics. That is such a good idea! i’ve always wanted a ration book of my own. i remember my third grade teacher bringing in her mother’s ration book in class and –oh my goodness– i loved it!! i was born in the wrong era!! Oooh, I would so very much like one of those! How generous of you! I would love one of these. I also home educate my three children and we are very interested in WWII at the moment. Keep up your great work. It is always interesting to read about. I would love to be entered! Thanks for the giveaway. I still have my mums and every time children did anything about WWII out it would come, with lots of reminding how they must take care of it, and they did. Its to me not only an historical item but also sentimental as mum has now gone. Oh, gosh, a giveaway! I’ve been following your blog since I planned a World War Two themed party for my college friends last year. I had to print our ration books, which was not nearly as much fun. Where does one go about *finding* these things? I have read your blog for quite awhile now, but never commented before. I would like to be entered, please! That would be really great! Thanks so much for sharing! This is great!!! I would love to have this!! While I would love a copy of the ration book, what I’m also interested in is non-edibles that were rationed. Clothing, yarn, fuel. Is that is your ration book? Could you post an entire scanned ration book on your site or where could I find out that information. I’ve been reading books by Patricia Wentworth starring Miss Silver and rationing is frequently mentioned. By the way – you look great in your weight loss photo update! Good for you! 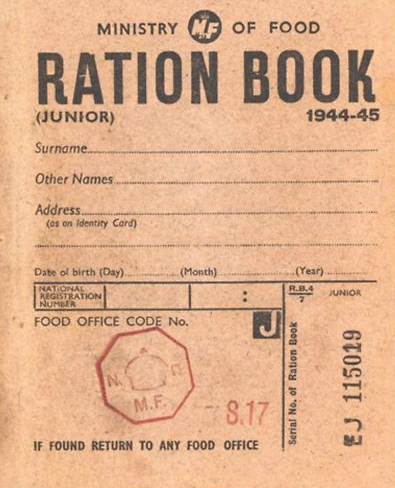 I would dearly love a copy of the ration book; it would be a treasured item in my 1940s collection. I would love to win one of those! It would be so interesting! I would love one of these ration books, as both my parents lived through WWII. thanks for the opportunity to win one! Hi Carolyn I was born during the war (1943) but have never seen a ration book. My father was killed in the war (I was one year old) and so my mother didn’t keep any wartime reminders. However, I would love to be put into the draw as I am very interested in the war years. Keep up the good work with the diet, you are doing so well. I would love to have one of these.We collect older items so this would be a nice addition to our collection. Great giveaway! I would love to have one for my 40’s scrapbook! That is so cool! My papa has told me about them. Its cool to finally see one. I would really love a copy to add to my (somewhat meagre!) home ed resources, however I dare not believe it will be as I NEVER win raffles etc! I really enjoy following your blog and find you very inspirational. I found your blog today via Pinterest and I love what you are doing! You look amazing and I wish you every success for the rest of your journey, I’ll be watching to see how you get on. Good luck! Love your blog, and sure would love that ration book. 🙂 Good luck! Hi Carolyn, Thank goodness I have my computer back up and running. You look AMAZING. Keep up the good work. I was born in October 1943 and would love one of these ration books. Does this have the clothing, material etc coupons in it as well. My Mum was not one for collecting this sort of stuff unfortunately. I love your site!!! I would love to win. Good luck everyone! Ooh we would love to win this please!!! Really enjoying your blog, its really helping our month on rations! So cool! I just found your blog via Pinterest (mmm….Marmite Cheese Whirls!) and I love the idea. My dad is always telling me that the reason people in his generation in Britain are so healthy is because of wartime rationing. Your experiment definitely seems to be proving him right! We’re trying to live on a very low income and it’s very much back to basics when it comes to food and everything else. 1940s rationing recipes have been very useful. I’d love a copy of the ration book because it would put things in context for us. Great stuff Carolyn! I’ve enjoyed your blog. Congrats on what you’ve achieved. Hi there, I love your blog and would love the ration book. My son and I have been living on wartime rations since Boxing Day and my son (11 years) loves it and said that he doesn’t want to stop. He loves the measuring out of everything and all the new recipies we are cooking together. We are here in New Zealand so are enjoying all the salads and heaps of veges, we are vegetarian and find it so easy. We also have chooks in the backyard too, plenty of eggs. Alot of the meals are what I grew up with when a lived with my grand parents in the 70’s as they had been through both world wars. All the best for your further weightloss and look forward to reading more of your blogs. Oh I would love to have one. I have been working at losing weight for the past year, and am down 50 plus pounds. Good luck with your journey. Just wanted to comment (for the first time) that I appreciate the honesty and bravery it takes to post your endeavours with weight loss in this medium. I think it is a novel approach to presenting your challenges and struggles. Congratulations on creating a much-needed dose of reality through a very interesting perspective: a throwback to more nutritious times. …and a ration book from the 2nd World War would be pretty great, I’ll admit. But that isn’t why I wrote that. All I can say is that you have some great idea and some really cool things. The extra ration card would be a tangible connection to the past. I love history and have been watching your videos and reading your blog without comment for sometime. I’m an American who loves England and history and have always been fascinated by World War II. I have a small collection of 1940’s cookbooks and British government pamphlets regarding the ration and would love to add the ration card to that. BORN IN 1938 I HAD A RATION BOOK ! I’ll print out this page, cut out your names and place them all in a bag and select three at random tonight when I get in from work. I’ll select the three winners on video so you can see all is fair..
Love your blog and would be pleased to win a ration book so I could start my own journey! My daughter is learning about wartime, what a wonderful piece of replica to show to her fellow students at school. love to win this. My mother is 86 this year and we are having a 1940’s birthday party for her. This ration book would be just great to give to her and help her bring back the good old days for her. I realize this giveaway is over but, I think you and I have the same Idea, live on a ration book to lose weight. Where did you order your ration books? I am organising a 90th & 70th surprise party for my mother & sister it is 40s themed , i have a childhood friend who does rienactment he will bring with him his friends who are kindly giving thier time to make it as authentic as possible i had the idea of sending the invitations in ration book form i think this will be quite an education for those who have not expierienced the life in war time london any sugestions would be fully apreciated yours faithfully alan parish. Replace the ‘_’ in the above (only on each side of ebay) and paste it into your browser window. We also had to get fancy dress, but only had £19.40 to spend on it (trips to Charity shops). Hi Alan- these are the ones I bought too- they are http://www.ebay.co.uk/itm/Pack-of-10-Replica-World-War-Two-Ration-Books-NEW-/200904540500?pt=UK_Collectables_Militaria_LE&hash=item2ec6d80154 great little things!